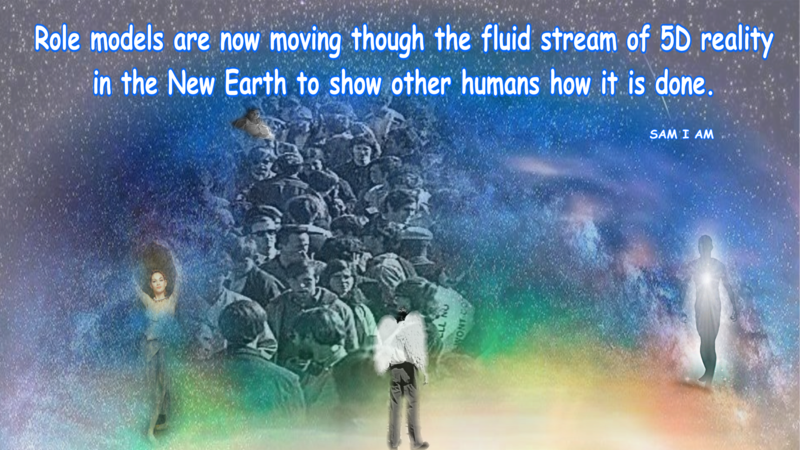 As these energy waves of consciousness continue to move into the earth, I notice lately the truth we were told so many years ago; energy affects people in different ways. Some people deal with this energy by being angry. We can help those and others around us by spreading love and light if we are ever in the midst of anger. For instance, in the community where I live sometimes people are very angry and yelling when energies are high. When this occurs (and other times as well) I radiate Love from my heart’s core to fill the area. 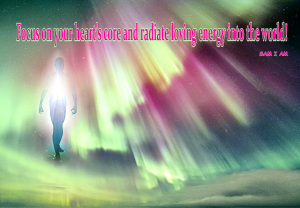 This not only helps the body of which my soul experiences physicality, but helps the community as well for remember everything is energy, radiating out into space, so when you focus on your heart’s core and radiate that loving energy out into the world, you help not only your body but the bodies of all those around you. And that radiation of loving energy continues to spread throughout the earth and beyond it. This is a very practical tip that one can use during times when it seems the anger within people is increasing. Remember, the end result of chaos is nirvana but we must first move through that chaos. You can choose to be in the chaos, or not. You can choose to match and feed chaotic energies or you can choose to neutralize them and nurture harmonious thoughts by radiating loving energy out into the world. Experiences of good often increase when we concentrate on inspirational thoughts. Find channeled messages in Book of One 🙂 Volume 3 , Book of One 🙂 Volume 2, and “Book of One 🙂 Volume 1″ available through New Leaf Distributing, OR visit SAM I AM Productions to support the author by purchasing books there and not through greedy corporations. Loving You! 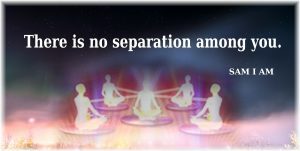 “This is not to say that those within that consciousness of separation will be eaten alive but yet they will be consumed, focusing all attention on separation. And as this separation continues to rule their world, it shall consume not only their thoughts but their body as well. “When first upon your beloved earth, your bodies were not made to be as dense. They were not made to be separate in thought, in word, or deed. They were meant to be a joyous occasion, to glorify the Oneness within all, to celebrate this truth. But this is not the state of the earth today and as those knowing the truth move towards this Oneness, in essence, those not knowing the truth move away further from the Oneness. 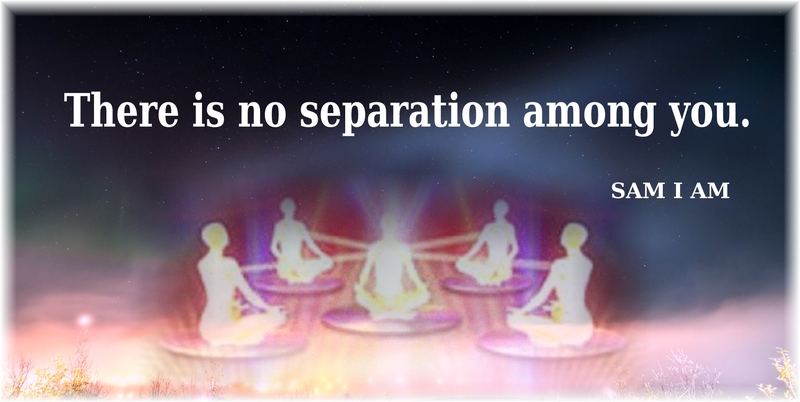 “As your news reports this separation, and focuses totally on this separation, those living within that thought system will no longer be able to free themselves into the Oneness of which many now awaken. And yet, many other humans will awaken to this truth. They will be brought to a point where they recognize the Oneness of all life and Truth. Many humans are now struggling to survive within your world and this is leading them to that Oneness. For as they struggle, those awakened see their struggle and seek to help. Those able to help in this knowingness of Oneness will do so and those awakening will continue to reach the fruition of their efforts through the knowledge that all are connected. “All humans connected upon this earth will sense this connection. 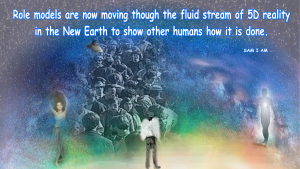 All humans upon this earth now move steadily toward either the separation of the individual from Oneness or the coalescing of the Oneness for all. “All is well my child as you move though these phases of raising consciousness for yourself and that of humanity. It is with the greatest respect that we the White Winged Consciousness Of Nine ask you to be more aware of the possibilities that lie before humanity. This is not to say become involved in these possibilities but to be aware they are there for many sleeping humans. 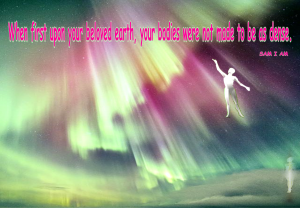 Those still not ready to reach higher states of awareness and truth shall become increasingly burdened with consequences of their own making, by giving their power away, by using their free choice and will to allow other, what they believe to be more knowing, humans to make their choices for them. “Much of humanity quickly moves toward these conditions while a much smaller group of humans, awakened to the Truth of BEing continue to make their own rules. 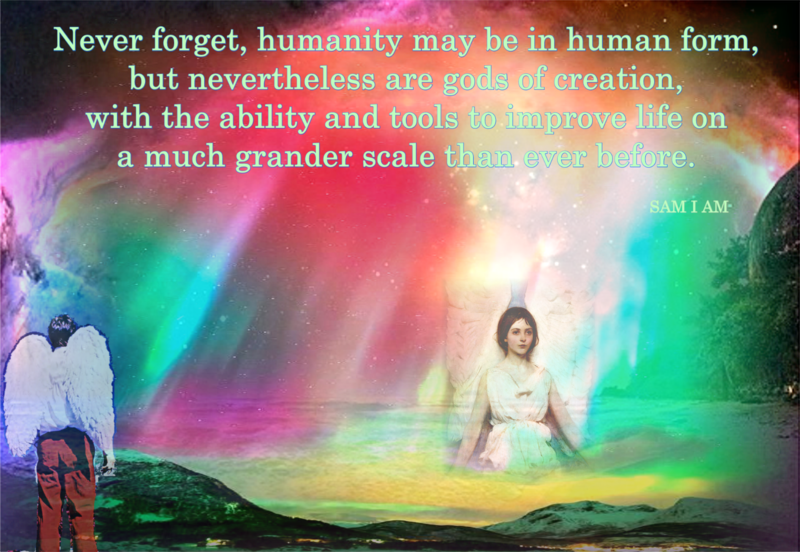 Never forget, humanity may be in human form, but nevertheless are gods of creation, with the ability and tools to improve life on a much grander scale than ever before. “We wish all to know: the Truth of BEing lies inside each individual form waiting to be recognized and utilized for the good of all. There is nothing to stop humanity from this recognition but its own small self of one. Each human holds and must recognize this power held within or succumb to another life on other planets to receive the blessing. Your earth as it is now is changing and shall not be in the state held for eons of time. “We are the White Winged Consciousness Of Nine and we are here to speak to the role models of America. There are many of you who know your roles well. You are the ones who have left behind all debris of the 3D life. You have nothing left. Your relationships are gone. Your belongings are gone. Your family for the most part is gone. You have no close friends. You are the role models of America and you are here to speak your truth. “You are one; you are all one and it is time to live by the Law of One. There are those among you who will go to great lengths to prove, to show, that there is none other but one. This will be done by visiting other countries, other areas, along with other states of consciousness. All those within this realm of gross illusion, know their role, if not consciously then on an unconscious level. “Those that are role models are now moving though the fluid stream of 5D reality in the New Earth to show other humans how it is done. It is done by leaving behind absolutely everything you have known before. It is done by setting aside your habits of separation, your habits of the illusion of separation. It is done by moving through the seeming chaos that many see and live through and not being distracted. It is done by knowing that the Universe, so to say, the Law of One, has your back and this network of One is the new reality of the New Earth. “Are you a role model of the New Earth or are you a reporter of the drama? The choice is yours. Accept your role and know each human plays its role well, consciously or not. “Know this, the higher realms lie within each soul, each human to channel at will. We are the White Winged Consciousness Of Nine and we are here to assure humanity, you are not alone. You have never been separate and you never will be, but in your earth game, it became necessary to believe this was so while in human form. “As humanity now moves through this process of recognizing its self, its true self of Oneness, we ask all that are now aware of this achievement of Oneness in all aspects to help those lost in the maze of forgetting. You do not do this by preaching but by being a role model. By showing other humans there is another way to think, to act, to listen to others without judgment or separation. We ask those of you who now are in the midst of re-membering, remember there are no good or bad aspects of anything but merely roles to play. “Play your role well by knowing and showing there is no separation, you are the God you seek. You are the one to look up to, each and every human is a soul encased in human form playing her or his role well. For no one is on earth by mistake. We and others have addressed this many times and will continue to do so as humanity moves through this shift in consciousness. There are no strangers on earth, there are no fools, no saviors, no one is here to be held above the other. When you judge another you are merely judging your own self. “Be careful to achieve the Oneness you seek by knowing all on earth are gods of matter, here only to play the game of earth life and help humanity return in all aspects to Wholeness, Truth, Love and Light.